Summary Administration is for a limited number of circumstances and generally for smaller estates or those where the decedent has been dead for more than 2 years. The Law Office of David M. Goldman PLLC handles cases of Summary Administration Probate in Jacksonville, Duval County, St. Johns County, and Clay County and the rest of Florida. In a Florida Summary Administration, the individual must have either died more than 2 years ago or the assets that are subject to the administration of the probate must be less than $75,000. When calculating the assets subject to probate, its important to remember the life insurance, stock accounts, retirement accounts, bank accounts and one's main home is not usually subject to probate. If you do not meet these qualificaitons you may need to use a standard Florida Probate. Often an individual's primary asset was their home. When this is a homestead, it passes directly to their heirs as proscribed by the Florida Constitution. One problem with this is that even though title to the home will pass, it is not considered Marketable Title. Marketable Title is one that is free from the threats of litigation. Because of this, most title companies will require a determination of the homestead status on the house. Once this is done, the deed to the home can be cleared up and the property will be able to be sold. The Law Office of David M. Goldman works with clients all over the world to clear title to homes through a Florida Summary Administration. If you need help with a Florida Summary Administration Probate an individual or a family member who resided in Florida or had real property in Florida at the time of their death CONTACT our Florida Probate Lawyers by email or call us at 904-685-1200 to discuss your situation today. 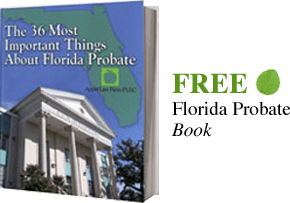 To determine how much your probate should cost and begin to gather and organize the information necessary for the Florida Probate, please take a few moments and request our Florida Probate Intake Form.